The first time I learned of this extraordinary singer I was taking a road trip with a friend to the Pyrenees. About two hours in, she began teaching me the words to one of his most praised songs, Palomica. I thought I would bewilder everyone and sing a typical Aragónese folklore song, a jota, for Christmas Eve cena (dinner). At large family meals in Spain, many talented and extroverted family members sing and tell jokes. As I belted out the first word of the song, P-A-L-O-M-I-C-A (loving pigeon), I knew it would be impossible to impress as the song has too many highs and lows for an untrained voice. One should be better instructed to tackle such a feat -not a car ride. But I did so after a glass of vino (wine) or two and could see the sonrisas (smiles) and laughs as I, well, bombed. One does not just pick up jota naturally. In the case of Pastor de Andorra (José Iranzo Bielsa), he did not either. At the age of twelve, he started singing while working alone in the fields safeguarding his flock of sheep. Later, while serving in the military during the Guerra Civil Española (Spanish Civil War 1936-1939), a sergeant recommended he take lessons from Pascuala Perié Gracia while stationed in Zaragoza. Later, Perié went on to be one of the most iconic jota cantantes (singers) of all-time. So it was not until San Valentin of this year that I got to meet this exceptional man. 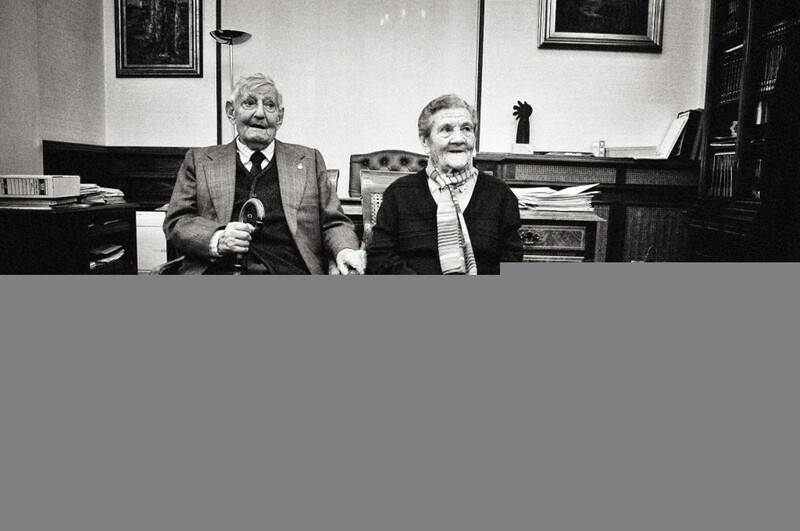 He and his mujer (wife), Pascuala, were being honored by the city of Teruel for seventy-five years of marriage. Every year, on this day, couples are recognized in the City of Love for twenty-five and fifty years of matrimonio (marriage), but very few, if not only them, have ever been celebrated for seventy-five! 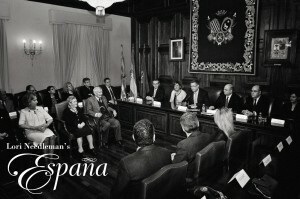 When they entered the upper floor of the Ayuntamiento (City Hall) to be honored, the sea of faces cleared the way to allow them to be seated in Mayor Manuel Blasco´s office for an interview with the local television and radio stations. They were placed in chairs and everyone was looking down on their fragile torsos. Both were almost one-hundred years old, Pascuala will turn one-hundred in June and José in October. With cameras flashing and microphones close, they were asked questions like what makes a seventy-five-year marriage work. José ready to entertain and blurted out a few jokes here and there. He told Aragón TV that when his wife is yelling at him he turns a deaf ear. Completely enamored with her when they met in the pueblo (village), Ventorrillo, José was certain she would never go for a shepherd. She was beautiful and smart — he was less educated. But with courage, he called Pascuala´s mother and asked if he could see her. Her mother allowed and this little shepherd went on to do great things with Pascuala by his side. From his humble beginnings in the region of Aragón, he proceeded to sing throughout the world including Belgium, Cuba, England, France, Germany, Holland, Luxembourg, Mexico, the United States, and even for the King Hassan II of Morocco at his palace. The secret of their success: I believe after watching them together it is his remarkable use of humor which makes her laugh every day. Their endearing, kind words and mutual respect towards each other after all these years helps too. But I couldn´t help to wonder more about his wife. I witnessed her intense gaze as I photographed her. She looked directly into the camera, with no fear, and allowed me to enter. I was taken aback by the strength in her eyes and wondered what she has been through living to be one-hundred years-old. As the ceremony continued, I watched him share his humorous tales with the crowd. For such a spirited, positive person, it is hard to believe that he began his life extremely poor and under difficult, tragic circumstances. Losing his father and two of this brothers to the influenza epidemic in 1918 all within 6 days, surely made this man humble, gentle and charming. As with the Aragonese, I fell in love with this kind-hearted shepherd and even more so with his loving, audacious wife. 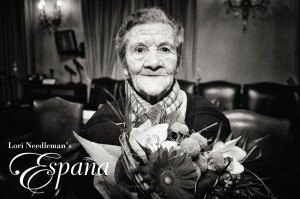 Share the post "17 ESPAÑA: Pastor de Andorra"
April 3, 2015 in lorineedleman.com, People.